Vicodin® is a drug that contains hydrocodone and acetaminophen; it is mainly used to treat moderate and severe pain as well as coughs. However, hydrocodone contains opioid which is highly addictive. In light of this, a lot of people are addicted to prescription opioid drugs like Vicodin. 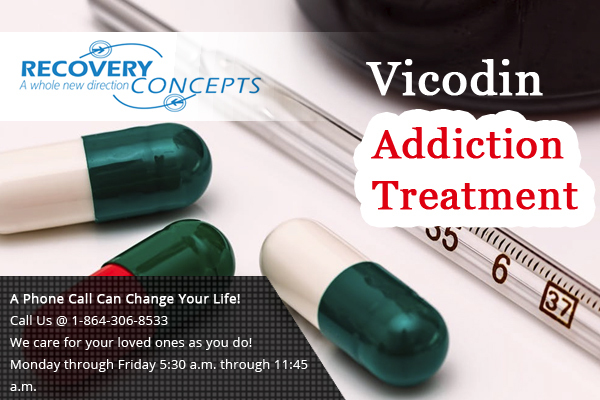 Recovery concepts offers Vicodin addiction treatment and de-addiction counselling at their facilities in Easley, Spartanburg, Greenville, Pickens and Anderson. Save a life by referring a Vicodin addict to any of the facilities for professional assistance. Vicodin overdose due to pain related issues is the cause for a substantial number of accidents every year. To alleviate this, professional counsellors and de-addiction experts at our facilities use methadone to treat Vicodin addiction. Moreover, the treatment is tailor made to suit different patient Vicodin addiction rehab requirements. Patients may experience withdrawal symptoms and Vicodin addiction treatment side effects like; vomiting, pain, insomnia, trembling, agitation, nausea and sweating. It is advisable to be non-judgmental when dealing with a hydrocodone addiction treatment patient. The Vicodin addiction treatment presents harsh withdrawal symptoms that may trigger relapse among patients who lack adequate moral and emotional support. Hence, it is advisable to seek professional Vicodin help at any of our facilities in Easley, Spartanburg, Greenville, Pickens and Anderson. Vicodin addiction rehab patients who are medically supervised during their de-addiction period tend to respond better to treatment as compared to patients who are not supervised regularly. This is because, Vicodin addiction patients are taught how to live a great and drug free life after recovery by our counsellors at recovery concepts Easley, Greenville, Spartanburg, Anderson and Pickens facilities. They are trained to live a sober life without falling into relapse temptations. Hydrocodone and Vicodin addiction treatment tends to be more effective when patients join support groups where they learn from other people’s stories on how to sustain a drug free life and cope with the different withdrawal challenges. They learn how to gracefully say no to drug abuse and relapse temptations. Support groups trigger self-realization and self-control. 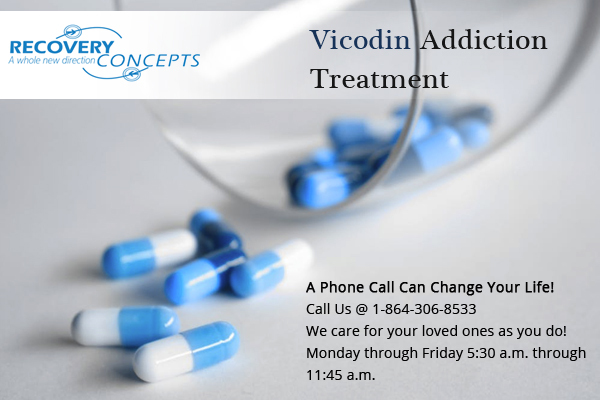 If you have a close relative or friend who behaves differently after consuming Vicodin, does not feel comfortable without consuming Vicodin, has an urge to take more and more of the drug and takes more than the prescribed daily dosage because they claim it is their favourite drug, it is advisable to sort professional Vicodin help at any of our recovery concepts facilities near you. Walk in to Recovery Concepts Greenville facility for help and treatment. We are here to help. Call us today at 864.306.8533.